Opening hours: Most shops are open Monday to Saturday from 9am to 5pm. Some retailers are open on Sunday including the Plaza, which also trades until 9pm on Thursdays. Coffs Harbour is teeming with attractions. You'll be delighted with the shows at Dolphin Marine Magic and the colourful clownfish and lionfish at the aquarium. Popular activities include swimming, sailing, surfing, diving and fishing. Visit the Big Banana, explore a World Heritage rainforest and walk through a flight of butterflies. 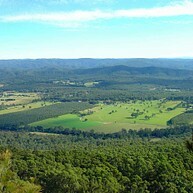 Sherwood Nature Reserve provides opportunities for picnicking, birdwatching, car touring and bushwalking in a peaceful setting. Discover the spectacular biodiversity and natural beauty of Sherwood Nature Reserve. Just a short drive from Coffs Harbour near Woolgoolga, you can explore striking landscapes ranging from rugged sandstone escarpments and coastal ridges to dry open forests, heaths and vibrant subtropical rainforests. There’s an abundance of wildlife to see, with old-growth forests and other habitats providing refuge for over 50 native animals including the brush-tailed rock wallaby, long-nosed potoroo, powerful owl, giant barred frog and leaf-tailed gecko. Not to mention the incredible birdlife that makes Sherwood a birdwatching mecca. Go forest driving on Sherwood Forest drive and admire panoramic views of the coastline and Orara Valley. 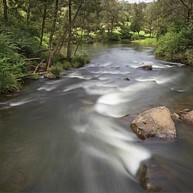 Enjoy peaceful bushwalking and outstanding birdwatching in the rainforest on Falls walking track. Or just sit back and relax at Woolgoolga Creek picnic area and immerse yourself in the tranquillity. Coffs Harbour is the southern gateway to the Solitary Islands Marine Park, a very unique mix of tropical and temperate fish life; the waters of the Solitary Islands are just like the southern Great Barrier Reef with a mix of Fish from the south. Jetty Dive Centre pride themselves in their high level of PADI training, from PADI open water Scuba courses all the way through to PADI Instructor. Jetty Dive Centre love scuba diving at the Solitary Islands on their daily dive charters for snorkelers or scuba divers, and their large and comfortable dive boats offer the best diving available. 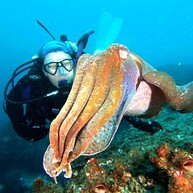 Passionate dive crew have the knowledge and experience to show you the best of the Solitary Islands. 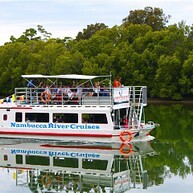 Jetty Dive Centre offers Whale Watching from their fast Adventure boats. Get to the Humpback Whales fast and spend all your time watching these magnificent giants! Whale Watching trips run three times daily from June to October and are dependent on the weather. Jetty Dive also has the first Whale Swims in NSW. After years of watching the Humpback Whales, they have developed a trip of a lifetime. Swim with Humpback Whales trips are an experience you will never forget.! 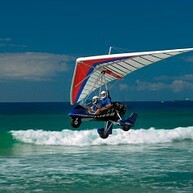 Experience a Trial Flight in Midcoast Microlights very scenic, beautiful Coffs Harbour training area which takes in Woolgoolga, Nambucca and Bellingen with its surrounding mountain range and spectacular waterfalls. The Foxbat Ultra Light Plane is a very relaxing way to view the beautiful harbour whilst testing out your flying skills or, for the adrenaline junkies, try their 'motor bike in the air' - the Microlight. Getting up to speeds of 160 kilometres per hour, experience the thrill of the open air cockpit in the safety of their instructor trainer Mark who has over 25 years flying experience. Each aircraft takes one passenger besides the instructor. Choose from either a half hour trial flight or a one hour flight. All ages welcome. Gift certificates also available. Their professional flying school is open Friday to Sunday. Other days by appointment only. Transfers can be arranged from your accommodation to their premises. On board the Osprey, up to 48 passengers can be accommodated, so if you are looking at something different and unique to do with your family or social group then why not consider one of our two or three hour cruises. A variety of menus are offered to suit your tastes and budget from Devonshire morning tea through to seafood banquets. The Osprey is licensed and can offer you cool and refreshing beverages. Great idea for your birthday, work party, or just a get together with a group of friends. 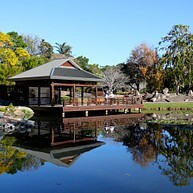 The Coffs Harbour Butterfly House is home to hundreds of Australian butterflies. Take a stroll in their walk-through enclosure and marvel at the brilliant colours as the butterflies flutter around, sometimes landing on you for a closer look. Learn about their fascinating life cycle from expert staff. Enjoy refreshments in the café and you can purchase a memento of your visit in the gift shop. Bongil Bongil National Park, south of Coffs Harbour, is a delight for nature lovers with beautiful beaches, sweeping coastal views and tranquil streams. The park is popular with locals for fishing, either on the pontoon by Bonville Creek or on the beach around Bundagen Head. Enjoy walks on the beach and through the rainforest. Climb up to Sawtell Headland, a great spot for whale watching between May and November. Picnic and barbecue facilities are also available. Nambucca Heads is one of Australia's most beautiful camping destinations. Named after an Aboriginal word that means 'entrance to the waters', Nambucca Heads is on the Coffs Coast and is known for gorgeous weather and a tranquil atmosphere. Caravan park guests can enjoy expansive water views, and wake up to breathtaking sunrises. Take a river cruise, or head to the Rotary Lookout or Captain Cook Lookout for superb views of the river mouth and ocean, with seasonal whale watching a bonus. Rafting is a thrilling way to appreciate the river's stunning beauty. Located within the Nymboi-Binderay National Park, the rapids of the scenic Nymboida River offer white-knuckle fun. Dramatic granite gorges and rugged rainforest-lined banks produce rapids renowned among whitewater enthusiasts. Visit Australia’s first and only dedicated cartoon gallery exhibiting the largest private collection of original cartoons in the Southern Hemisphere. 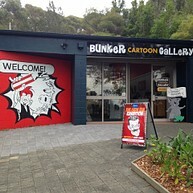 The gallery, housed in a WWII bunker, displays new cartoons year-round, with blockbuster exhibitions around every two or three months. An international go-kart facility with fun for all the family, Raleigh International Raceway is 15 minutes south of Coffs Harbour. 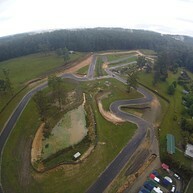 Single and double karts are available for laps around the challenging 1.1 km forest track. Open daily, the park also has the Big Foot tractor ride, as well as two waterslides, sheltered barbecue areas, and Putt Putt Mini Golf. You'll enjoy hours of family fun. These beautiful gardens are just a kilometre from Coffs Harbour's town centre. A subtropical haven of 20 hectares, wheelchair accessible paths and boardwalks lead to glasshouses containing rare orchids, cacti and tropical species. Take the Aboriginal Plants Walk and then wander in the rainforest. Beautiful water features, mangrove boardwalks and a sensory garden with plants that tickle the senses, make the Botanic Gardens a delightful experience.